After entering this section, you will very easily find all kinds of spare parts for New Holland tractors. You can search by product and/or New Holland tractor model. The products we show you have two reference types: the New Holland OEM reference and the reference for the part manufactured by Repuestos Fuster, which has a cheaper price and has the same quality features. Fuster spare parts are non-original of guaranteed quality, as their production process follows the strictest quality controls, from the materials used to the part finish and final packaging and labelling. 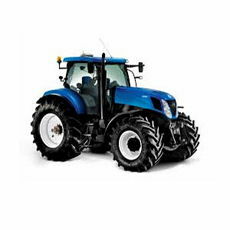 It is more than likely that you will find the spare part you need at Repuestos Fuster, as we have an extensive selection of parts compatible with all New Holland tractor models; even parts that are increasingly difficult to find on the market, due to their age, technical complexity or price. We have about 500 items for New Holland tractors that individually or combined add up to 10,000 commercial applications. And we have 99% of them in stock for 24-hour delivery to you, because neither you nor we want the New Holland tractor to lie idle in the field for several days. The complementary nature of the parts is something we always take into account when planning production. This is why our manufacturing is not limited to just the main spare part, but also covers parts needed for the complete assembly, so you will not need to resort to several suppliers for the gaskets, pins, screws or nuts, for example, that you need to perform the repair. Within this section there are different ways to find the part you need. If you know the item, the most direct way is to use Internet search engines, where, in addition to the Fuster reference number, you can enter the OEM reference, product name, New Holland brand and/or tractor model. If you do not know the item, there is a very intuitive way, which is searching the New Holland tractor spare parts menu. Here we show you all the products classified into eleven part categories (Cables, Body and cab, 4WD front Axle, 2WD front axle, Electrics, Hydraulic lift, Clutch, Linkage, Brakes, Engine and Transmission and power take-off). Within them, the products are listed and to their right the number of the part is shown. Clicking on the name takes you to the Fuster and OEM references to be able to place your order.